From I-481 take exit 3E, and follow Route 5 east for three miles to Fayetteville. The church is at 310 E. Genesee Street, between Walnut Street and Chapel Street. 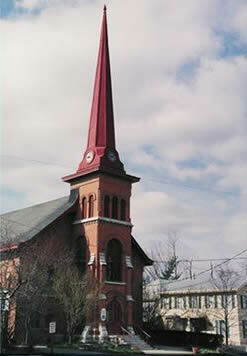 It is a brick church with a very tall, very pointy red steeple. You can get to the parking lot from Walnut Street (one-way going south), the church driveway (on the east side of the church, also one-way going south), or Chapel Street.